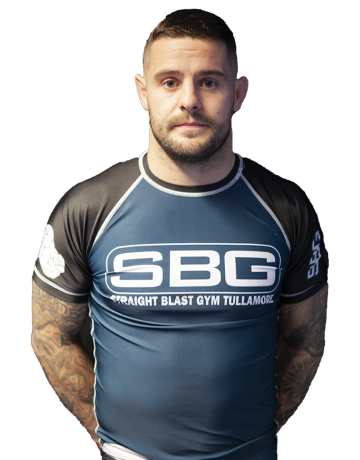 Kieran, Head Coach at SBG Tullamore is an SBG Belt Belt under Coach John Kavanagh following being promoted in October of 2018. It is coaching, learning and training that brings Kieran the most joy as well as watching his students learn and grow on and off the mat. Kieran was submerged in martial arts from the very young age of 7. His father practiced martial arts and enrolled Kieran in Karate and boxing. In time that lead to kickboxing and eventually MMA. It was there where Kieran became acquainted with Jiu Jitsu and his passion blossomed. Kieran has travelled the world training Jiu Jitsu and over the past few years he has visited Marcelo Garcia Academy NY, Renzo Gracie NY, 10th Planet HQ LA, Mjolnir Iceland, Ralph Gracie SF & Phuket Top Team. Kieran has cornered Fighter’s at the UFC Bellator, and Cage Warriors.